Elevate Energy now offers complete benchmarking compliance services to help multifamily building owners or managers comply with Chicago’s Building Energy Use Benchmarking Ordinance. In 2016, residential buildings great than 50,000 square feet are required to measure, verify, and report energy use. Expert staff from Elevate Energy will help streamline this process for you, from identifying whether your building is required to comply to verifying and signing off on the data. Click here for more information on our services. You can also email us at or call Maria Quiñones at 773-906-5140. A new report from the City of Chicago looks at the energy use of nearly 350 large commercial buildings. Reducing energy use in these buildings by 23 percent could result in $77 million in energy cost savings. 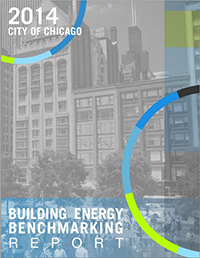 Today, the City of Chicago published its inaugural energy benchmarking report which examines data collected during the first phase of implementation of the City’s Energy Benchmarking Ordinance. Elevate Energy’s team of building energy experts provided key analysis and insight to help write the report. The ordinance, enacted in 2013, requires large commercial, municipal, and residential buildings (those more than 50,000 square feet in size) to measure, verify, and report their energy use data to the City. This year, commercial and municipal buildings larger than 250,000 square feet were the first group of buildings to comply. Participation was widespread. A total of 348 buildings reported energy use, accounting for 260 million square feet of space and 11 percent of total energy consumption in Chicago, including 77 facilities that reported voluntarily or early. The compliance rate for buildings required to report was over 90 percent. The unprecedented amount of data in the report helps us understand how Chicago’s largest buildings use energy, and the significant opportunities they have for energy efficiency improvements and savings. Chicago buildings show an enormous opportunity for improvement, with the potential to reduce energy use up to 23 percent. This would result in energy cost savings of $44 million to $77 million – Chicagoans currently spend $3 billion a year to heat, cool, and operate their buildings. Implementing energy efficiency improvements to reach a reduction of 23 percent could also create more than 1,000 local jobs. Chicago buildings reported a median ENERGY STAR® score that was lower than the national median. On a rating scale from 1-100, with 100 being the most energy efficient, the median score for Chicago buildings was 76. Energy performance in Chicago was in-line with comparable buildings in other cities, including New York City, Philadelphia, and Washington D.C. The buildings sector, which includes single and multifamily residences and commercial buildings, uses more energy than any other sector (such as industry and transportation) and accounts for more than 40 percent of total U.S. energy consumption. Here in Chicago, energy use in buildings is more than 70 percent of total energy consumption. Benchmarking provides a clear assessment of performance for similar buildings within Chicago and across the country and has clear benefits for many stakeholders. Building owners who understand how much gas and electricity their properties use and can take steps to reduce wasted energy, helping them lower energy costs and stay competitive. Building performance data also helps cities strategically meet energy efficiency and climate change reduction goals, by targeting energy efficiency rebates and incentives for buildings that have the most potential for savings. To support the Energy Benchmarking Ordinance, Elevate Energy played a key role in the implementation process, providing help center support and data analysis. Through a collaborative and effective partnership with the City, we were able to achieve more than 90 percent compliance from building owners and managers during the first benchmarking phase. “Our help center answered more than 800 calls and emails from building owners, managers, and service providers, ensuring high quality data and building a solid foundation for further investment in energy efficiency,” said Anne Evens, CEO of Elevate Energy. Up next for benchmarking: Commercial and municipal buildings between 50,000 and 250,000 square feet and residential buildings more than 250,000 square feet will measure, verify, and report energy use by June 2015; buildings that complied this year will benchmark and report. Stay tuned for a blog post about our role and lessons from the first phase of the Energy Benchmarking Ordinance. This year’s success provides the foundation for the remaining two years of implementation, and sets the stage for energy efficiency progress in Chicago. Click here to download the inaugural building report from the City. Click here for a press release from the Institute for Market Transformation.